At LSSC12, Mike Burrows organized an evening meeting on “portfolio stuff” (sic). He is reporting about this on his blog. In his blog he wonders whether the name “portfolio management” is the right name as it carries the bagage of failing approaches. 1) thinking about a project portfolio as a stock – when we talk about a project portfolio people tend to think about the portfolio as a stock that can be valued; they talk about optimizing the value of the portfolio, etc. Rather than thinking about the project portfolio we need to start thinking about it in terms of flow. 2) project portfolio thinking emphasizes functional/silo thinking – in your organization, do people talk about the “IT project portfolio”? The “development project portfolio”? If so, then you know what I am talking about. Talking about the “IT project portfolio” emphasis the IT function as a silo. Rather than that, we need to think end-to-end value stream. This leads me to the advice, drop the name “portfolio” talk about end-to-end flow. Let’s not talk about “portfolio kanban”; let’s talk about end-to-end kanban! The opportunity is not in going up in the hierarchy of the development silo. 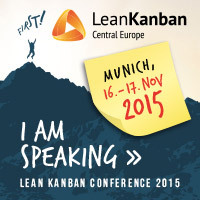 The opportunity is in broadening our view from “development kanban” to “end-to-end kanban”. What happens upstream? How can we support the upstream “business value discovery” process with visualization, pull, flow, collaborative improvement? How can we support the downstream “implementation and validation” process with visualization, pull, flow, and collaborative improvement? What does this end-to-end flow look like? What items are flowing? Just work items? Or is it options (as in real options) and commitments? Is it limiting “work-in-progress” only? Or is it also ensuring “minimal options”? Is it collaborative improvement within “development” or is it collaborative improvement across the end-to-end? I was not at the LSSC12 and the “portfolio stuff” meeting, so maybe I am repeating what was said already there. Still I thought it worthwhile to put in my 2 cents to the discussion.